The Bahia de Cadiz is a complex of Natural Parks (Parque Natural, 2 Parajes Naturales, ZEPA) and an important Ramsar site, and one of the best examples of Atlantic tidal marshes.in the Iberian Peninsula. 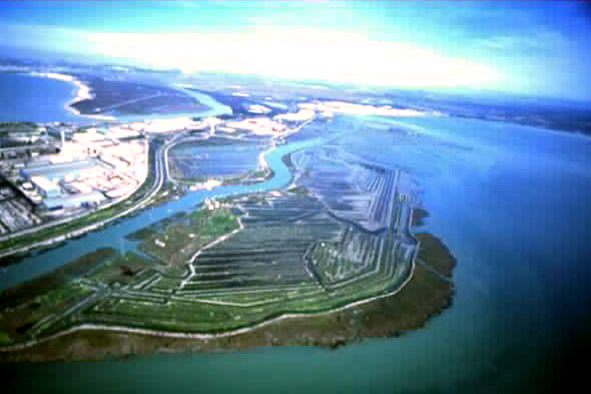 The position of the site between Doñana and the Gibraltar Straights help to make the bay one of the most important coastal wetlands in southern Europe. Natural habitats also include sandy beaches and rocky islets. The Bay of Cadiz is a crucial stopover site for migrating, breeding and wintering waterbirds, hosting more than 1% of 14 different East Atlantic populations. The Bay is crucial for spawning, nursery and feeding for a number of commercially important fish. The Bay was settled in ancient times by the Phonecians who built the first of the salt pans. Many of the once-huge expanse of salt pans, have been transformed into aquaculture pools or in some cases have reverted to more natural habitats. Outside the protected area much of the original saltmarsh area has been drained to make way for urban devlopment – it is surrounded by urban centres (400,000 inhabitants spread between Cádiz, San Fernando, Puerto Real, El Puerto de Santa María and Rota ) and the Cadiz port facilities, creating urban and tourism pressures on the protected area, as can be seen below. Importance: The Bahia de Cadiz is an outstanding example of Atlantic tidal marshes on the Iberian Peninsula. The site supports 200 species of birds (more than 65,000 individuals in wintertime) and 81 of macroinvertebrates (mainly crustaceans and moluscos), including globally threatened species. The Bay of Cadiz is a crucial refuelling stop for migrating and wintering waterbirds. It hosts more than 1% of the individuals of 14 different East Atlantic populations ( Platalea leucorodia – 6.3%, Charadrius hiaticula – 5.18%, Avosseta Recurvirostra – 3.91%, Charadrius alexandrinus – 3.20%, Himantopus himantopus – 2, 59%, Phoenicopterus ruber – 2,27%, Pluvialis squatarola – 1.74%, Larus fuscus – 1.31%, L. cachinans – 1.24%, Egretta garzetta – 1.20%, Phalacrocorax carbo – 1,16%, Tringa totanus – 1,01%), as well as of the breeding populations of 5 different shorebirds ( Platalea leucorodia – 2.1%, Charadrius alexandrinus – 1.59%, Sterna albifrons – 1.39%, Himantopus himantopus – 1.13% and Avosseta recurvirostra – 1,04%). The Bay is crucial for spawning, nursery and foraging of 9 commercially important fish species and harbours up to 60 different fish species. Wetland Types: The wetland habitats include tidal marshes, sandy beaches and rocky islets. Biological/Ecological notes: The Bahía de Cádiz presents a high primary and secondary production due to the important flow of matter and energy, characteristic of these kind of ecological border areas. The site supports Gastropods species as Turritella communis , Nassa reticulata, Murex trunculus and M. brandaris . A noteworthy species found in the saltmarshes is the crustacean Artemia salina , important as food for young fishes and some bird species. Waterbird species present in the site are Larus melanocephala, L. audoinii, L. minutus, L. ridibundus, L. fuscus and L. cachinans , and the sterns S. albifrons, S. Hirundo, S. caspia and S. sandvicensis. Noteworthy flora species present in the site are Hymenostemma pseudoanthemis Wíllk, Armeria gaditana Boiss, Stauracanthus genistoides, Sideritis arborescens Salzm, Verbascum giganteum and Taraxacum gaditanum Talavera. Hydrological/Physical notes: The most representative soils in the site are sandy and saline. Much of the saltmarshes have been transformed into salt pans. Nowadays, most of them are no longer in use and have reverted to more natural habitats or been transformed into pans for aquaculture. Annual average temperature is about 18ºC oscillating between 12.7 ºC in January and 24,5ºC in August. Human Uses: Most of the area is public land. Human activities in the site include aquaculture, salt exploitation and tourism. The Bay was settled in ancient times, as revealed by archeological remains. Conservation Measures: Bahía de Cádiz was designated as Natural Park in 1989. 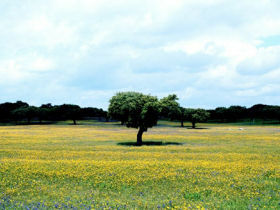 It is an EC Special Protection Area (Birds Directive) and a proposed EC Site of Community Interest (Habitats Directive). 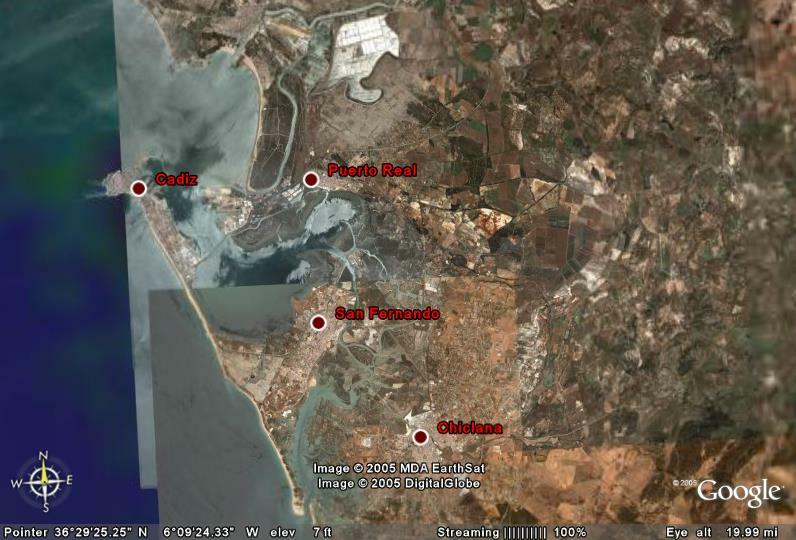 Adverse Factors: The site is surrounded by urban centres (400,000 inhabitants) and the Cadiz ports facilities. 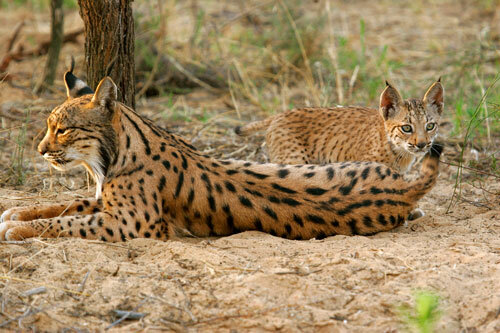 This creates urban, tourism and leisure pressures on the protected area.